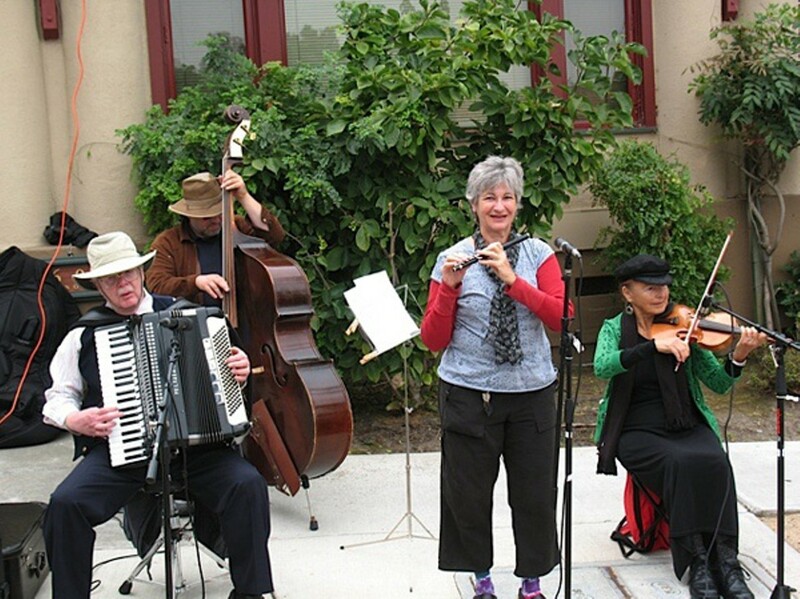 Due to a budget deficit, Solano Stroll can no longer afford to pay its musicians. The Ellis Island Old World Folk Band: one band you won't see at this year's Solano Stroll. Add another casualty to the list of damages wrought by the economic downturn: The Solano Stroll. Due to decreased sponsorship and grant funding, the annual street festival has opted to cut one of the biggest line items from its budget this year: entertainment. In June, executive director and events manager Allen Cain sent a grim e-mail to the ninety people who had applied to perform, and who passed through the board's screening process. "Our problems, some systemic — ranged from over-optimistic projections to unusually high rises in operating expenses," Cain wrote, before getting to the nit and grit: "We are asking you to perform for free. It's just that simple." But it isn't just that simple, said Carol Denney, who leads an old-time string band called Failure to Disperse. "We reserve our 'playing for free moments' for people and causes in need," Denney said. "And I don't think the Solano Avenue Association [which produces the Stroll each year] would ever put itself in that category." Cain has very little patience for musicians' protests. "We're a struggling nonprofit just like everybody else," he said, explaining that this year the association lost two cash sponsors, Andronico's Community Markets and Funky Monkey Snacks. It also had to do without the grants it normally gets from the Berkeley Civic Arts Program and Albany Civic Arts Foundation, along with other performing arts organizations. The association tried to recruit the US Marines to sponsor the event, but that failed because of the armed forces' turbulent relationship with Berkeley, Cain said — not to mention that the Solano Stroll is scheduled for September 11. Meanwhile, operating costs have increased, as Cain stated in his letter. Permits for amplified sound have gone up from $180 per band or location, to $200. The shuttle bus on Marin that used to cost $3,000 now costs $4,000 due to higher gas prices. Without commercial sponsorship and donor largesse, the event is woefully underfunded. The board actually knew that back in January, and Cain said that when he e-mailed bands back in March, reminding them to apply for the Stroll, he warned that this year, "compensation would be minimal." Still, Denney and flutist Carol Ginsburg, who runs the Ellis Island Old World Folk Band, said they were given no indication that "minimal" actually meant "zero." "Allen is fond of saying that they can pay anywhere from $0 to $300," Denney noted, recalling a range that Cain frequently uses when soliciting bands. "To me, that always seemed reasonable — sometimes you're a single entertainer, sometimes you're a five-piece band. But I can tell you that from all the people we've talked to, the pay has never been zero." When you include entertainment, the event costs $60,000 to produce, Cain said. Of that money, $25,000 is budgeted to sixty music acts. Portable toilets cost $6,000; insurance about $7,000; barricades $3,000; shuttle bus $4,000. The rest goes to staff salaries, and a whole concatenation of other expenses, including walkie-talkie rentals, jitneys, permits — you name it. Fortunately, the cities of Berkeley and Albany contribute police, fire, and maintenance services, which would otherwise add an additional $30,000 to $50,000. Cain didn't want to reveal what the board's deficit was this year. He did say, however, that it was large enough to necessitate significant cost-cutting measures, like moving all the amplified music down to the Albany side of Solano, where no sound permits are required. The board also slashed staff salaries, including Cain's. "This year, the executive director is making significant contributions to the organization," he said, speaking of himself in third person. "I've taken one for the team, let's say." In truth, though, the easiest way for the Solano Avenue Association to save money on the stroll was to eliminate the entertainment budget entirely. Cain said it made little sense to merely reduce everyone's salary, and he didn't think it fair to pay some entertainers more than others. He also argued that the musicians got ample warning about the association's dire budget situation. "The only complaints we got were from two performers," he said. "Everyone else was supportive of us as an organization, and of what we do for the community." But therein lies the problem: So many musicians are willing to work for free (or for tips) that it's possible that the Solano Avenue Association may have no incentive to ever pay its performers again. The Stroll's former director, Lisa Bullwinkel, said as much in an e-mail to Denney and Cain. "There are TONS of garage bands out there who want to play for free. Always have been. But when I was producing the event, I wanted to upgrade the talent and really tried to keep the level up by paying people and screening well. It will now plummet." Denney concurred. "Musicians will eat anything you give them," she said. "It's not a flattering thing to say about my lovely community, but it's true." Denney acknowledged that she and Ginsburg may be leading a lonely, two-band resistance. But their absence will still be felt at this year's stroll. Update: A previous version of this story contained a quote that misstated the Solano Avenue Association's position on the proposed Goodwill Store on Solano. The Association remained neutral on the issue. That version of the story also used a different headline.